In the Frostgrave rulebook there’s a section covering random encounters that the players may experience – pretty much along the lines of the monster tables you would find in old school RPGs. A quick jot up and I’ll need something like 37 creatures to complete the random encounters table. It’s not quite as many as it sounds from a painting perspective because some of these creatures are encountered in multiples – for instance in that 37 I’ll need to paint up 4 giant rats, 3 armoured skeletons, 2 zombies etc etc. There are some scenarios in the book that call for more figures which I’ll cover in time too. I’ve decided to try and do this as cheaply as possible, collecting and painting up what I need over the next few months, around my other projects of scenery building and finishing off my Chaos/Evil Warband. 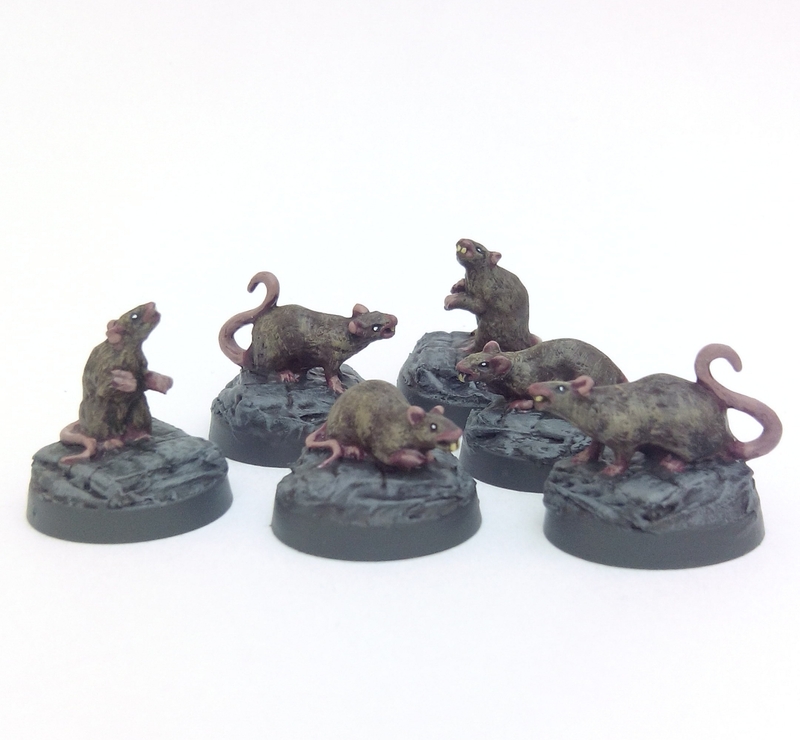 So to start here are the giant rats (I only needed 4 but I painted the whole pack of 6). 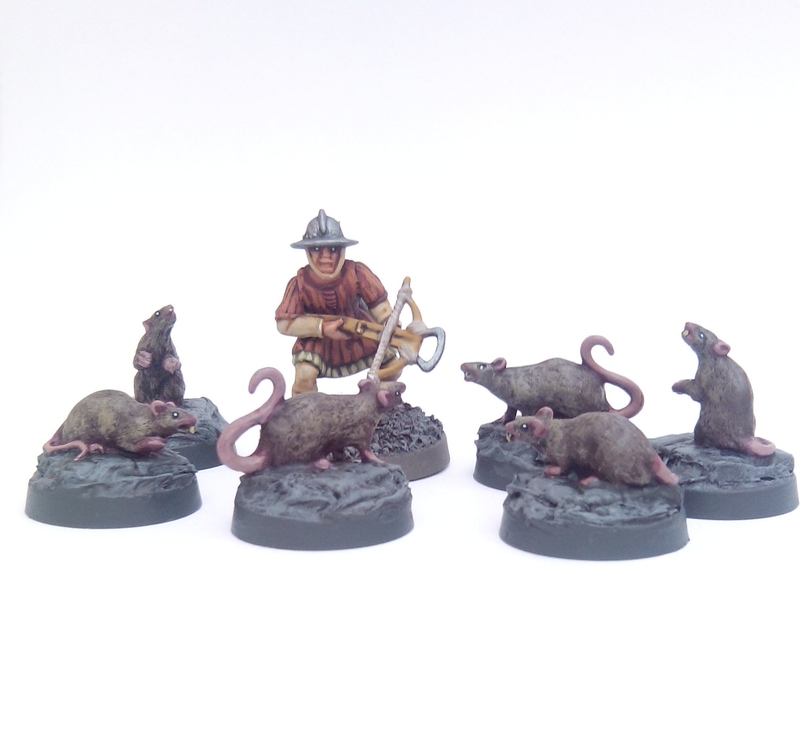 I had a bit of a dilemma deciding which giant rats to use. 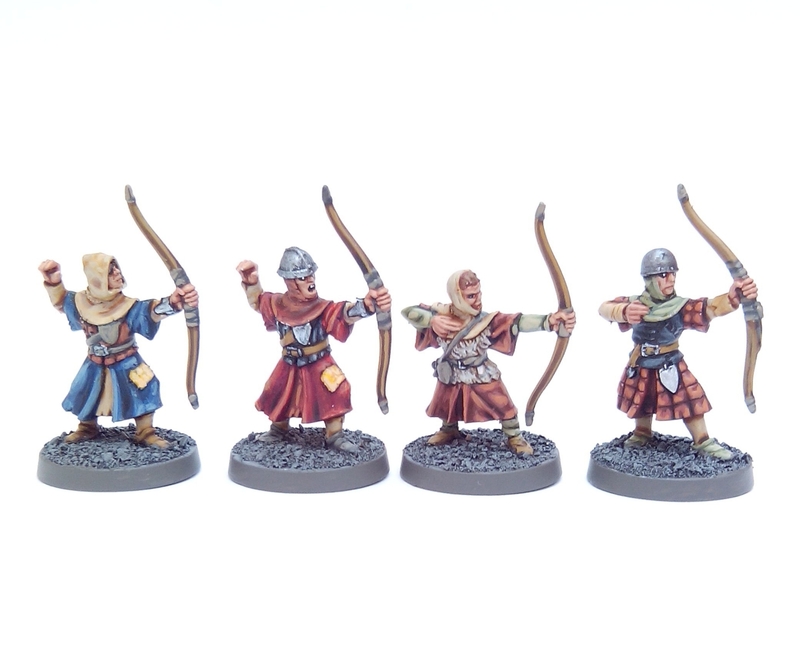 I weighed up various options but decided on using Reaper Bones figures, not only because they looked the most rat like but also because they were exceptionally cheap – less than £3 for a pack of 6. When they arrived I have to admit I was a little underwhelmed. They’re smaller than I anticipated (and I expected small!) and the detail on their bodies was a little lacking, even by Bones standards. On the plus side I liked the bases they were sat on, small squares imitating stone paving – very Frostgrave. Rather than buying alternatives I stuck with them, my reasoning being they’re only rats after all and they would only ever be a minor nuisance to Warbands. In comparison to other creatures they’d unlikely to be the highlight of any game so I wasn’t too bothered if they didn’t create a huge visual impact in play. They painted up very quickly and although the finer details aren’t great they definitely have a real rat feel to them that is missing from some of the larger sculpts that often make rats look too shaggy furred and lupine in appearance. I quite like how they fit neatly onto 20mm round slotta bases too. Scale wise against 28mm figures I’d compare them to a smallish dog – so whilst they’re not huge they’d still be a worry to an unprepared or wounded PC. This entry was posted in Post-1990 and tagged Frostgrave, Giant Rat, Reaper Bones on September 27, 2015 by Hobgoblin Orange. 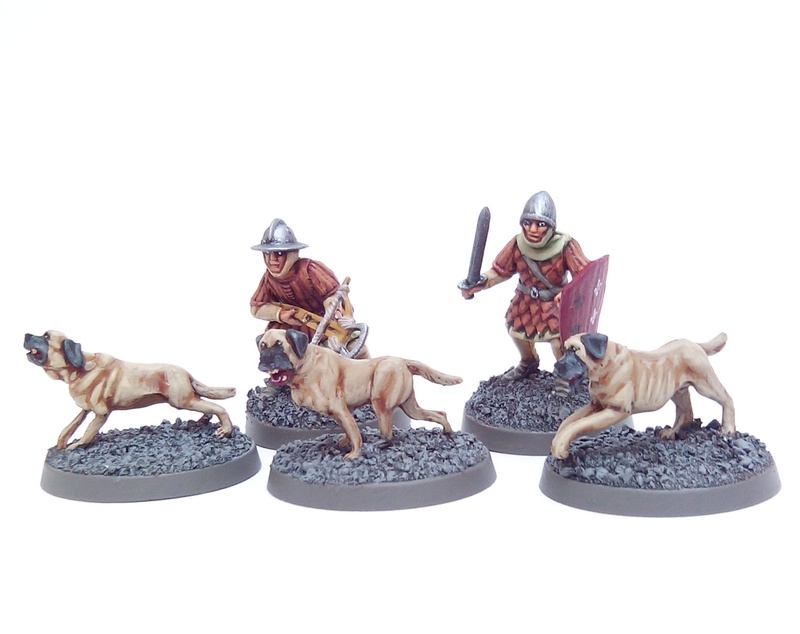 In addition to the Frostgrave soldiers I also had some dogs suitable for use as warhounds lurking in my lead pile. 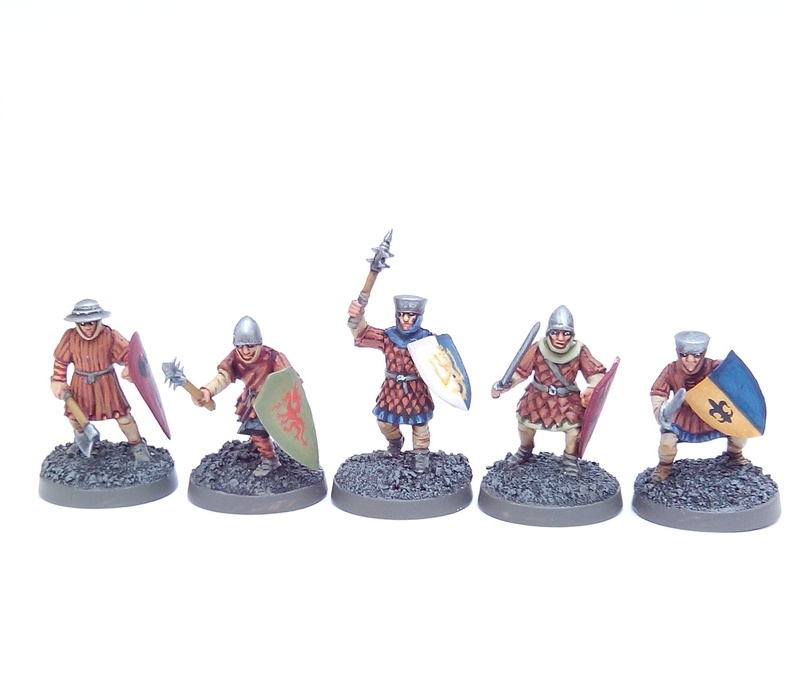 These are made by Warlord Games as part of their 28mm Ancient Britons range. 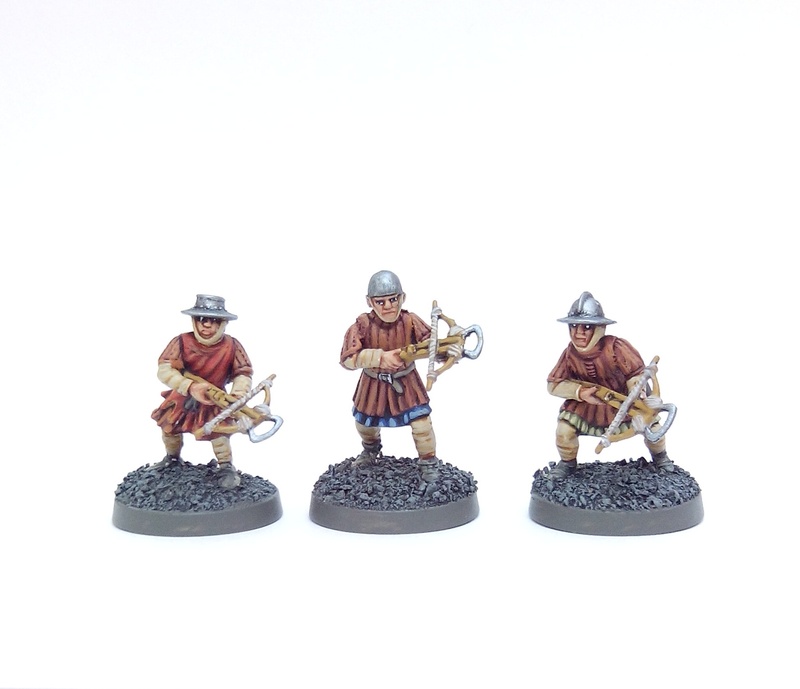 I originally bought these for use with a fantasy Barbarian force but I think they’re too small compared to the Grenadier/Mirliton Barbarians I wanted to pair them with. They seem okay scale wise against the Fireforge and GW figures although I still think they’re a little on the small side for Molossers. 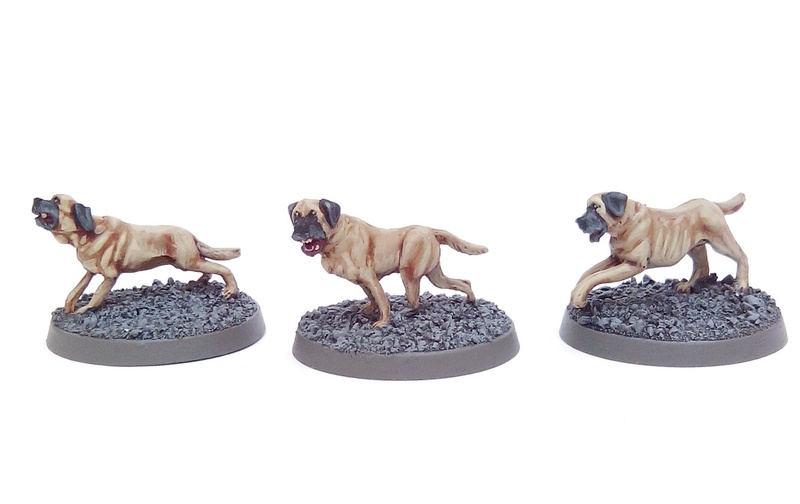 I painted them up roughly based on Bull Mastiff colours with fawn coats and black masks. I had to put them on 30mm round bases as they’re too small to be mounted individually on either 40mm round or GW rectangle cavalry bases but too big to fit on 25mm bases. 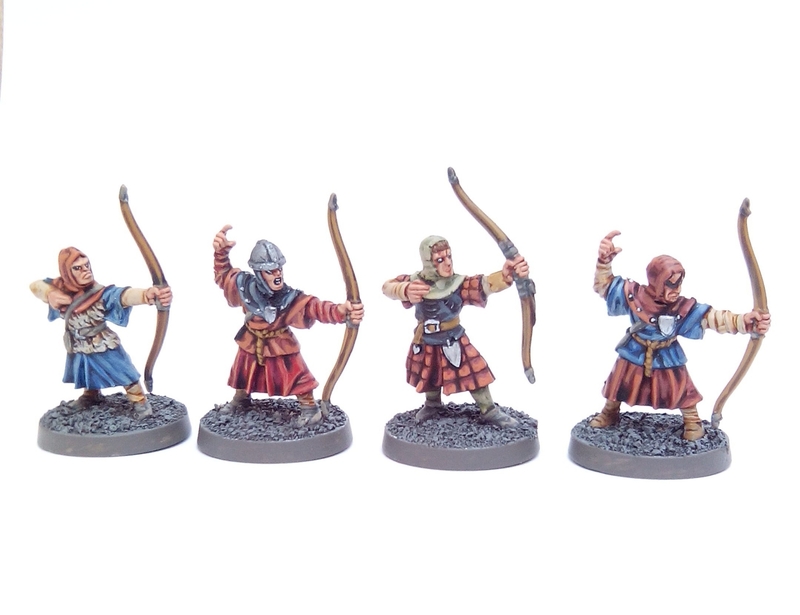 As with the other recent posts I’ve based them for use with Frostgrave. This entry was posted in Post-1990 and tagged Frostgrave, Warlord Games on September 19, 2015 by Hobgoblin Orange. It’s best that I start with an apology as this post is about a really obscure game you’ve probably never heard of and will probably never see for sale. Sorry! However if you try to search for this game you’ll understand my frustration with it’s elusiveness. I consider this post an admittedly desperate attempt to find out if I can track it down or see if anyone else remembers it. Most of my gaming circle are of a similar age to me but none of them have ever heard of it. Back in 90/91 as a result of a review in either GM or GMI magazine I bought an A5 sized ruleset called ‘The Sleep of Reason’ from an independent gaming company – presumably a ‘one man band’ outfit. I have to admit at the time I wasn’t playing much beyond GW’s Warhammer Universe but the positive review (possibly by Steve Blease) and the description of the system really piqued my interest. This was a far future/sci fi skirmish miniatures game where Earth had made contact with an Alien race called something along the lines of the ‘Kray-vaars’. This contact had initially gone well but both Aliens and Humans realised they carried diseases fatal to each other. The new arrivals subsequently destroyed most of Earth by mutating toxins in an attempt to eradicate the human threat to their species. Humanity had given them a dose of killer man flu and was left battling to survive against the Aliens who had mutated the landscape, flora and fauna of Earth beyond recognition in an attempt to destroy Mankind. The game included (amongst other things) Aliens, Human troopers, Terminator style armour called Manitou Suits, various weaponry and grenades, combat drugs, mutants, zombies, cyborgs, robots, crystal trees and weird flying jellyfish. What more could you ask for? Another interesting idea was it’s take on mutated zones that could shift over the course of the game making terrain that started safe at the beginning possibly deadly by the end. This could prove just as problematic as any enemy engagements unless your troops had the correct sealed suits to survive. I can’t remember the exact mechanics it used for combat but I do recall it relied on simple math(s) to minus attack values from defence values to work out combat and then somehow reverse the results to calculate damage. The game was designed to be used with any range of figures. I used to use a mix of GW and Fantasy Forge (now Scotia Grendel) miniatures – Space Marine Beakies, Terminators, Orks, Zombies, Nexus Marines, Hellcats and Kryomeks. The author was Russell Jackson, he lived in the York area of the UK and his company was called Dream Demon Games. Sadly my copy of the game got destroyed in 2003. You can probably guess by now that I really want another one. I can’t find anything about the game, the author or the company on the internet other than Spirit Games in the UK once stocked it. I contacted Spirit but they didn’t have any copies left, apparently it was an old link I’d managed to find. They subsequently removed the link from their website. Here’s a pic of the front cover. As much as I’d like to ask about it on the various gaming forums I think my post would sink unanswered fairly quickly. Not only that but I reckon it’s pretty bad form to join a forum for one question and disappear – I don’t have time to frequent forums properly. Has anyone else played this game? If anyone knows where I can get a copy or has one they want to sell please let me know too. Russell Jackson if by pure chance you get to read this please get in touch, I’d love to ask about how the ruleset was developed! This entry was posted in Post-1990 and tagged Dream Demon Games, Russell Jackson, The Sleep of Reason on September 1, 2015 by Hobgoblin Orange.